Online pokies and gambling in Australia has managed to surprise a lot of people except, perhaps, for the Australians themselves. For many Australians, online pokies and gambling in Australia have become matters of pride. Around eighty percent of Australians gamble in some way, shape, or form. However, there are some forms of gambling that are more popular than others, even in a culture where gambling is most definitely the norm. A shocking six hundred thousand Australians play pokies once a week or more. Since Australia only has a population of 20,264,082, this is a genuinely huge percentage of the population. Out of the Australians who play pokies, a full 38.6 percent of them play their pokies online. As such, online pokies really are a big business in Australia. 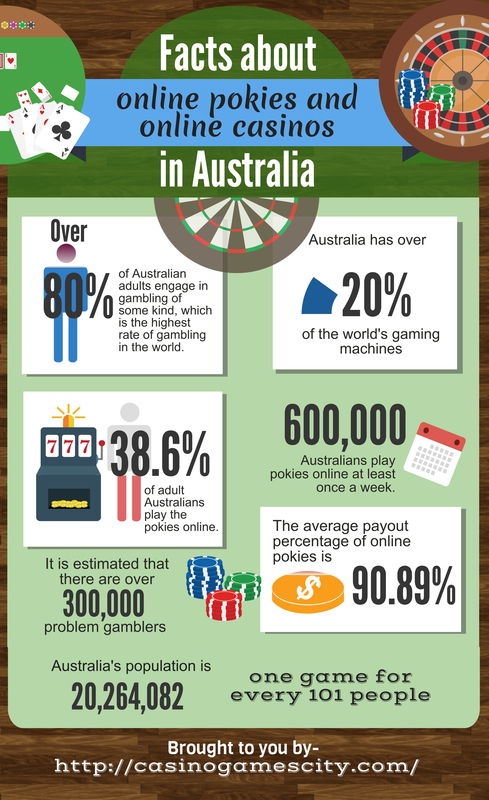 One in five of the gaming machines of the world are located in Australia. This is a culture that cannot seem to get enough of online gambling, whether the games are online or whether the games are physically located at a casino. Since these pokies can give people an average payout of 90.89 percent, people really have that much more of an incentive to keep on playing and trying to succeed, which is only going to normalize the act of playing these kinds of games in Australia further.